"This is a recipe adapted from my Cuisinart® ice cream/yogurt maker booklet. We love the smooth creamy texture even after storing it in the freezer. Our favorite blend of juices is lime and mango. We like to keep it low cal by substituting in no calorie sweetener. This is an especially refreshing dessert on our hot southern summer evenings. I fix it inside while my husband is outside grilling." Place the mango pieces and sugar into a blender. Puree until smooth. Add the lime and orange zest and juices along with the tangerine juice. Puree until evenly blended. Pour into a container, and refrigerate at least 1 hour, preferably overnight. Pour the chilled mixture into an ice cream maker and freeze according to manufacturer's directions until it reaches "soft-serve" consistency. Transfer ice cream to a one- or two-quart lidded plastic container; cover surface with plastic wrap and seal. 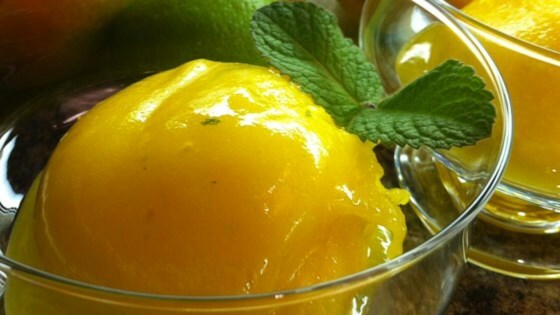 For best results, sorbet should ripen in the freezer for at least 2 hours or overnight.